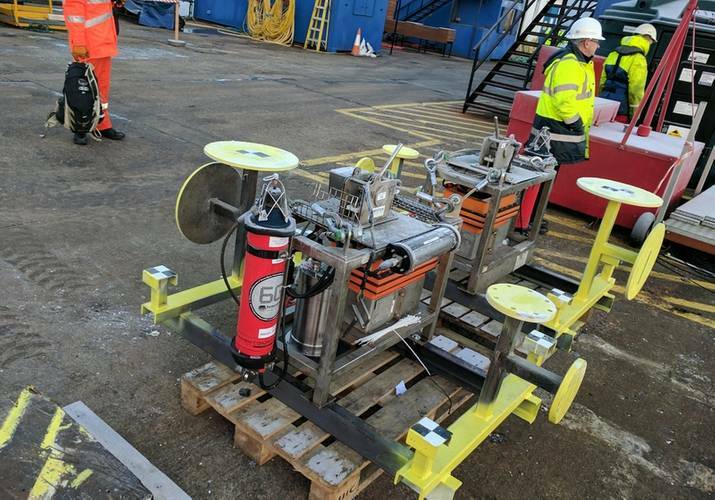 DOF Subsea, together with subsea technology companies Sonardyne, 2G Robotics and Seatronics (an Acteon company), successfully demonstrated a new underwater surveying technique in December that could significantly shorten the time needed to map underwater structures and offshore sites. Representatives from across the North Sea energy sector, including senior figures from oil majors, contracting companies and service providers, attended the demonstrations which were held over three days at The Underwater Centre in Fort William. The event was organized by DOF Subsea to showcase the capabilities of dynamic mobile mapping. 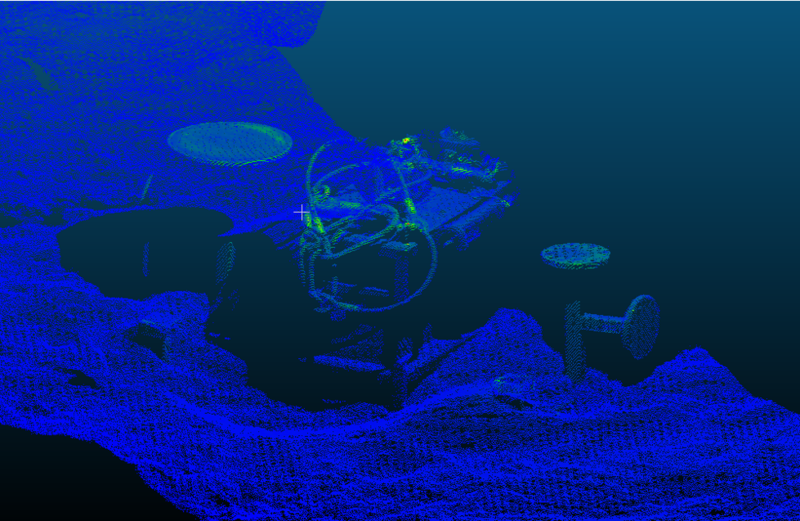 The new technique uses a 3D laser scanner fitted to an ROV to create highly detailed, point cloud images of subsea assets and environments. By combining the 3D laser data with precise underwater acoustic and inertial navigation information, it is now possible to generate centimeter resolution engineering models from which accurate measurements can be instantaneously and repeatably captured. In conventional marine construction support terminology, metrology is the work done by surveyors and ROV to acquire various subsea measurements, typically between flanges on separate pieces of subsea infrastructure. These measurements allow precise fabrication of subsea jumpers and spool-pieces. Traditionally the vessel time to acquire the measurement data can take between six and eight hours per metrology. The adoption of a smart combination of proven technology can reduce data acquisition (and hence vessel) time to around two hours. Partners DOF Subsea, Sonardyne, Seatronics and 2G Robotics decided upon an open strategy of bringing interested companies together to demonstrate a direct comparison between well-proven acoustic long-baseline (LBL) metrology and the new possibility – acoustically aided dynamic laser mapping using inertial navigation (AAINS). Acceptance of any new solution in the industry is a staged process, and the first step is often raising awareness of a challenge and its solution. The efficiency demands in the current marketplace provided an opportunity for DOF Subsea and its technology partners to put this event together and bring their solution to light, openly sharing knowledge, performance data and technical conclusions between a multitude of invited contractors and operators in a single event. 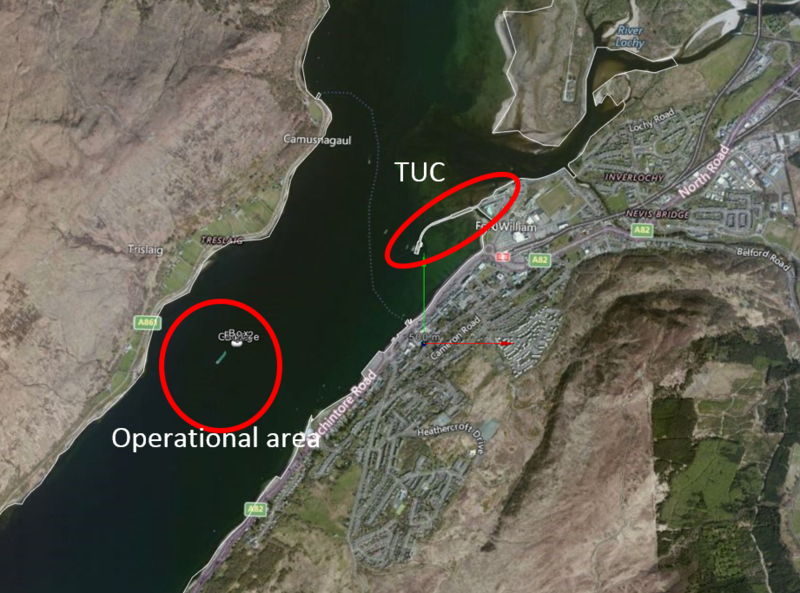 In late November, representatives of the partner companies descended on The Underwater Centre in Fort William to prepare and conduct trials prior to the demonstration day. 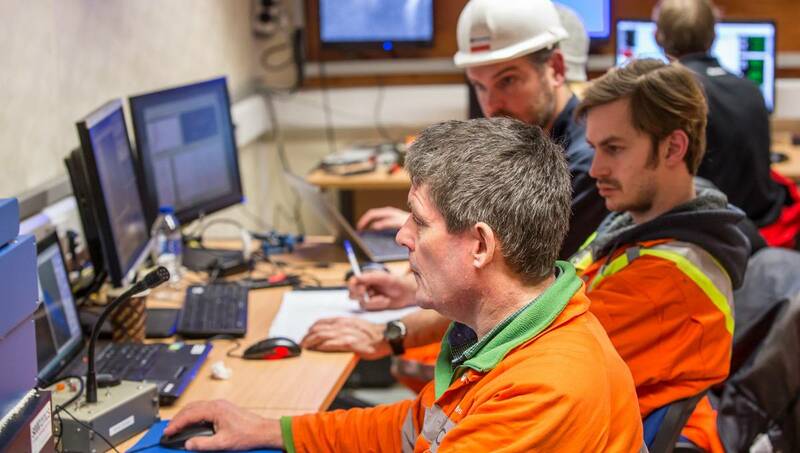 Work was planned to take place aboard the vessel named Loch Sunart in Loch Linnhe, kitted out with all of the necessary equipment, including a work-class Triton XL ROV with TMS. The work site was chosen, southwest of The Underwater Centre pier. Key metrology and INS technicians visited from Sonardyne in England, equipment specialists arrived from Seatronics in Aberdeen, and laser engineers from 2G Robotics traveled from Waterloo in Canada to observe the study and deliver the classroom sessions to guests. In three days, two complete metrology solutions (LBL and AAINS) would be mobilized, configured, tested, full data gathering, data processing and reporting. Days one and two focused on mobilization, ROV integration, sparse LBL array installation, traditional LBL metrology data acquisition and results. On the third day, laser data acquisition began. VIP guests arrived from leading contractors and operators to learn more about the capabilities of the AAINS solution and a deep-dive classroom session into technical aspects of data gathering, processing and analysis from experts in their field who were on hand to share their knowledge. Preparation began shortly before mobilization. Each company is an expert in their field, which produced a collaborative working environment with a high degree of cooperation. This can-do approach to problem solving and vigilance for cost saving opportunities contributed to success and is essential in the current financial climate. Design and fabrication of the bespoke subsea structures was a joint effort between Seatronics and DOF Subsea. Cost efficiency was at the forefront during planning, so the structures were based on existing off-the-shelf subsea gyro boxes. They included temporary additions of yellow circular flanges, horizontal planes, custom targets and bracketry to represent actual and potential measurement points typically on subsea wells, trees or manifolds. As December approached, the common goal of delivering a high quality, open comparison of LBL metrology versus AAINS metrology to the industry moved into view. Using Faro Focus laser scanner, a DOF Subsea Dimensional Control surveyor conducted as-built laser scans of the target structures. The scans were processed and millimeter-accurate information relating to the structures was now in hand. Gathering dimensional control survey data introduces significant opportunities for later in this process, specifically new inferred metrology calculations. The survey control room was initiated and mobilization began. 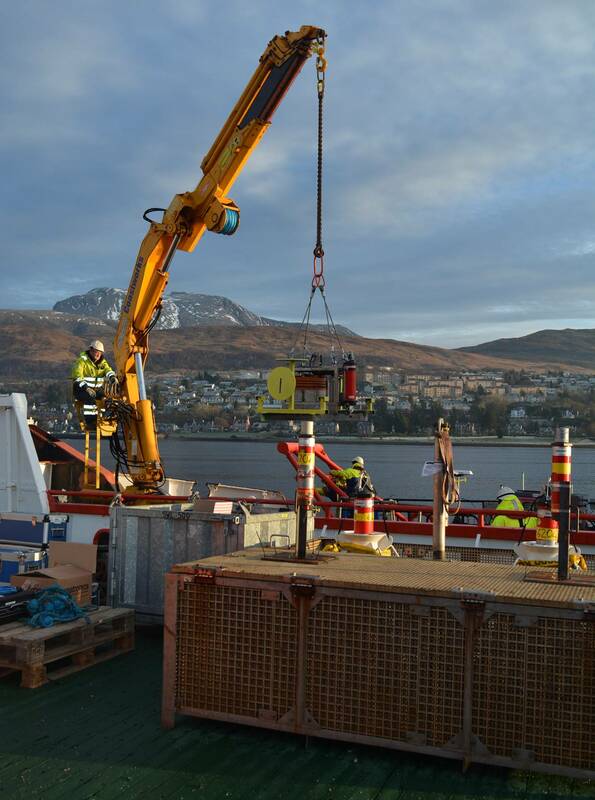 Support vessel Loch Shiel had a DOF Subsea tug pack installed to allow telemetry of position and heading to the survey control room to allow remote tracking of the vessel. Structures were loaded onto the vessel and readied for deployment. 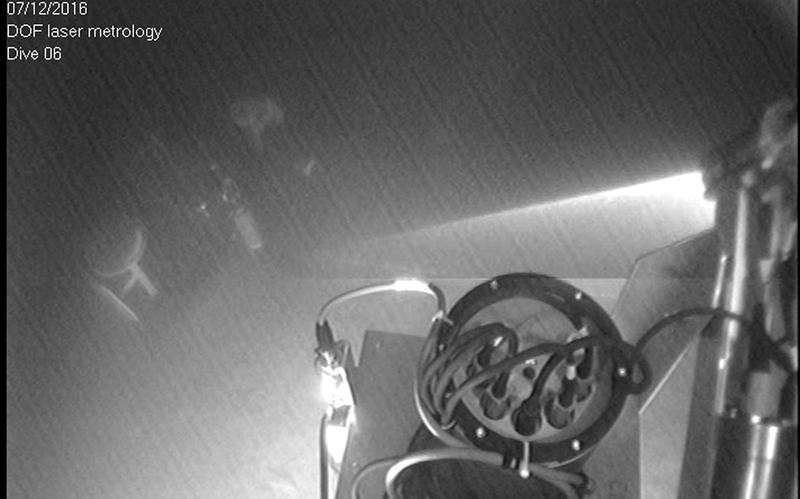 A temporary acoustic long baseline (LBL) array was created up on the seabed around the structures. Sonardyne provided the necessary Compatt 6 LBL transponders which were swiftly deployed by Loch Shiel using a standard subsea basket supplied by Seatronics. Approximate positions of the compatts were established using Loch Shiel GPS. The purpose of the compatts is to create a temporary, stand-alone high accuracy relative positioning system between (known as the array) removing the need for high accuracy absolute positioning of the compatts themselves. Focus was on calibrating/adjusting the array system and conducting the traditional LBL calculations. Depth measurements between the structures were done via the ROV, using handheld digiquartz pressure sensors. Next, baseline measurements were taken between the array and compatts installed in specially-made receptacles in the subsea targets. The array was used to establish accurate positions for the seabed structures. 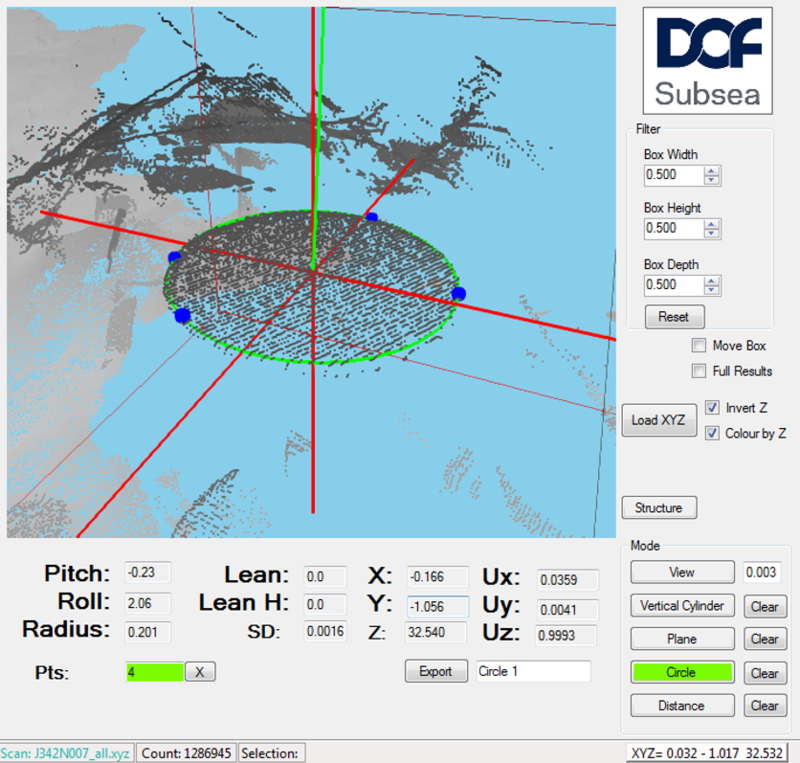 Calculations were done on the raw observed data using Sonardyne Connect software, in addition to verification using DOF Subsea Metro solution. 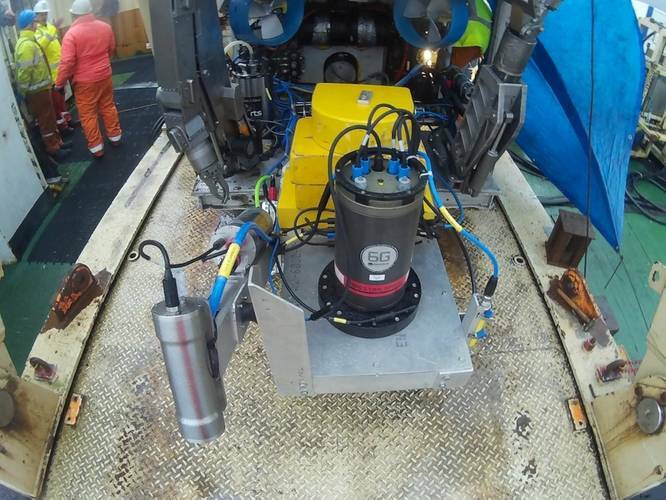 The following morning, the team was ready to proceed to acquire a comparison data set, delivered by the ROV positioned using the AAINS system, in conjunction with dynamic laser scanning via the 2G Robotics laser. When using sensors such as multi-beam sonar or lasers for seabed/asset mapping, it is vital to conduct a patch test. This patch test allowed the surveyors to establish any corrections required to the laser data in three rotational axes – pitch, roll and heading. It is conducted using automatic survey tools and manual interpretation. The final quality control step was to establish any laser Index Of Refraction (IOR) corrections which may need to be applied to the raw laser readings. This involved flying the ROV with laser over any structures at varying altitudes. During post-processing, the high-accuracy acoustic position data is combined with the inertial navigation data, hence the Acoustically Aided element of the robust AAINS positioning solution. Without this technique, drift would be a negative factor in the quality of the final position fixes of the ROV. ROV data acquisition missions (or runlines) were planned, at an altitude of 3m above seabed, to ensure maximum laser coverage over the two target structures being surveyed. During laser data acquisition, it became apparent that particulates in the water created a significant amount of noise in the laser data which resulted in lowering of the planned altitude. Flying the ROV at a very low altitude over the structures would not typically be required and places extra demands on ROV pilot skill. Operators monitored the laser data live in a waterfall-type display in the 2G Robotics Scansoft software. This tool provided instant quality control over data and prevented conducting missions with no immediate indication of the quality of data being acquired. The acquired AAINS data was begun to be processed using the Sonardyne JANUS software and the point clouds delivered by the laser were cleaned and georeferenced. DOF Subsea Metro software was used to derive unit vector measurements from the final laser scan point clouds. These results via AAINS and laser would be compared to the LBL results. Guests from Contractors and Operators arriving at lunchtime were unable to travel by FRC to board the Loch Shiel to witness the laser data gathering due to the high winds on the loch. In place of the offshore trip, classroom sessions were organized by the technology partners to deliver a real deep dive into the AAINS laser metrology solution. The sessions were informal and designed to involve the audience in asking questions and challenging the technology partners to best communicate the method and logic behind this new technique to provide subsea metrology calculations. Experts from 2G Robotics, Sonardyne and DOF Subsea answered questions and laid out the various aspects of the metrology, from sensors to point cloud interrogation calculations. 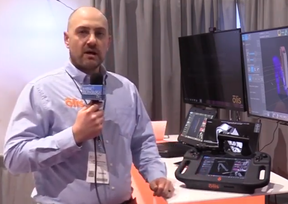 The full end-to-end workflow was traversed in detail, from ROV mobilization through to final report, provided by DOF Subsea Metro survey application. In keeping with the open culture of the event, all attendees were provided with a full metrology report, copies of all data, photographs and other materials for independent verification. 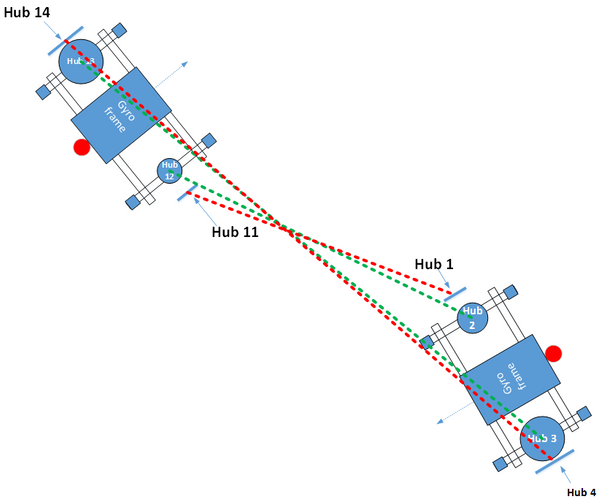 DOF Subsea’s Metro application supports two types of laser point measurement techniques – direct and inferred. Direct measurements can be taken typically by taking a circle or plane fit through an easily identifiable section of the point cloud. The inferred method is made possible by conducting dimensional control surveys of the asset prior to subsea deployment. The results of this survey are used in combination with a 7-parameter shift (scale, pitch, roll, heading, X, Y, Z) to transform any dimension control results into the real world. This allows establishing a georeferenced XYZ and 3-axes rotation for any point on a subsea structure, even without gathering a laser scan of the part of the structure which is to be measured. Nonintrusive - No prior subsea intervention was required in advance of metrology, and no subsea bracketry, control spheres or metrology aids are required. Time to Data - Quick delivery of results offshore; typically within six hours of data acquisition. Data processing was conducted in parallel with array recovery operations. Correction: 2G Robotics' laser engineers traveled to Fort William from Waterloo, not from Edmonton as initially stated.